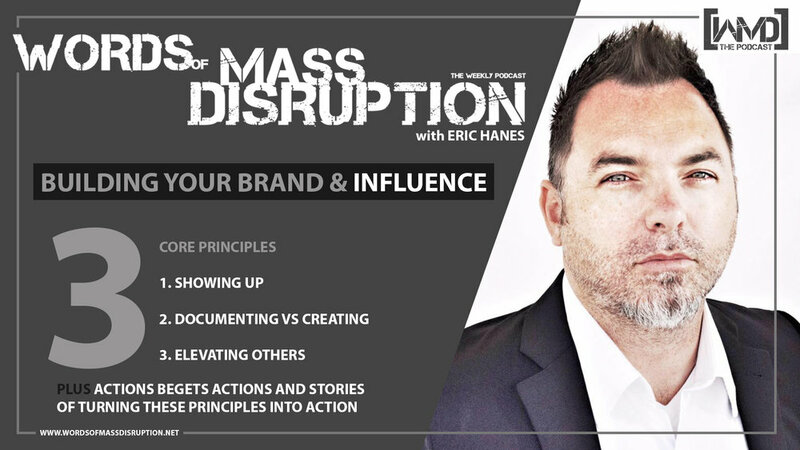 We talk to Nima Khanghahi about BUILDING YOUR BRAND AND INFLUENCE. Nima is just getting started on his new career path of speaking and influencing, he has been a sales coach and trainer... and, I personally think he is a natural at it and has a bright future ahead of him. Nima believes in three core principles when it comes to building your brand and influence; Showing Up, Documenting Versus Creating and Elevating Others. When I saw Nima present these principles to a room of at least 50 people and saw his very interactive style, I knew I needed to have him on the show. He has a way of engaging with people in a meaningful way, whether is one on one, or a large group of people. His first principle of Showing Up, is something I believe in and is one of the first pieces of advices I give to people for just about everything. When we talk about showing up, we are talking about something you do in a consistent and intentional way. You are present, you are giving your full attention. Just by showing up you will often uncover new opportunities and be ahead of your competition. 1. I showed up early. I was there before the big crowd, I could make some early new friends before the mad rush started. I scoped out the place for friendly faces. I looked for faces I wanted to meet, and I made several introductions. I was introduced to several new contacts, some of which I have met with again since then. 2. I showed up with intent and a focus. I knew why I was there and what I wanted to accomplish. I set goals in my head and made sure I accomplished those goals. I didn’t waste time doing things that didn’t accomplish those goals. 3. I had a positive attitude. If you go into a situation like this and treat it like a complete beat down, people will catch on to that vibe. If you go in with a positive attitude, people will react much more positively to you. 4. I closed the deal. I stayed afterwards until I checked off a few more goals. I met the keynote speaker and a couple of award nominee’s and winners. I met several new faces that were on my list. But, more than anything, this action created more opportunities, because people introduced me to other people that I will do business with in the future. Maybe I will help them, maybe they will help me. I did see a couple of people I know there that were obviously struggling to get out there and meet people. Hiding in a dark corner of the room, frozen by that voice telling them all the excuses of why they shouldn’t be there. Remember that action begets more action, getting out there leads to opportunities that you would otherwise never get. The second core principle Nima talks about is Documenting Versus Creating. The idea here is that we have so many excuses, we ended convincing ourselves to never start. We end up never starting on our journey or doing that thing that will take us to the next level. As soon as you start thinking of what you must do to create something new, your brain freaks out and starts putting up all sorts of road blocks. Instead of saying, “I am going to CREATE my own podcast.” You say, “I am going to DOCUMENT my thoughts and message on the web.” Just changing the word from CREATE to DOCUMENT, your brain will put up less defense and you are more likely to get started. My very first episode was me telling myself something very similar. I started a podcast in less than week after I decided to do it. If I listen to my brain and all the excuses, I would never have started and never created a podcast. The third principle Nima talks about is, Elevating Others. On the show this week he talks about a touching and interesting story of how a simple act of elevating somebody that most people never think about or even notice turned into something much bigger. In this age of social media, giving and not taking is more important than ever before. If you hold your hand out there to take, you are going to have a tough time getting anywhere and you will disappear quickly. If you take the approach of give, give, give… then things will happen by default. This is another form elevating others. If you walk into every discussion or meeting with someone, just looking for what is in it for you… you will struggle. You will find it hard to build a long term meaningful relationship with those people. You will find it difficult to get others to look at you as a partner or a trusted advisor. Don’t be the small person in this quote. When you elevate others, magic happens, ideas and thoughts form that make things even greater. Treat people around how you would want to be treated. It is not a complicated notion. Nima KhanGhahi is a passionate sales coach, leadership trainer and speaker that focuses on developing and influencing people to maximize their full potential. With the help of many mentors and leaders he has been able to learn and teach many strategies that have taken people to the next level. His passion comes from helping people identify what they want to accomplish and then helping them get from point A to B.